Smooth and full of flavor...Just like your favorite brand of cigarettes. Straight up American Cowboy tobacco flavor. 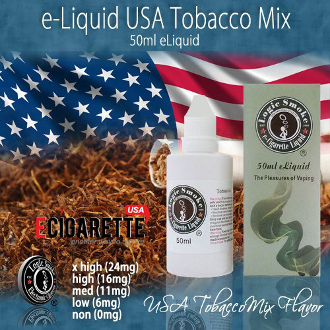 USA Mix is a great tobacco e-liquid for anyone who is searching for a specific cowboy cigarette flavor. Numerous e-smokers credit this e-liquid with aiding their switch from standard cigarettes to vaping.